When my kitchen is stocked with food, I can never think of what to make. But when my kitchen is completely empty that’s when I come up with the best meals. For the next couple of days, my mission is to make as much as I can from scratch using only what I have in the house. No food shopping. No special ingredients. No take out. 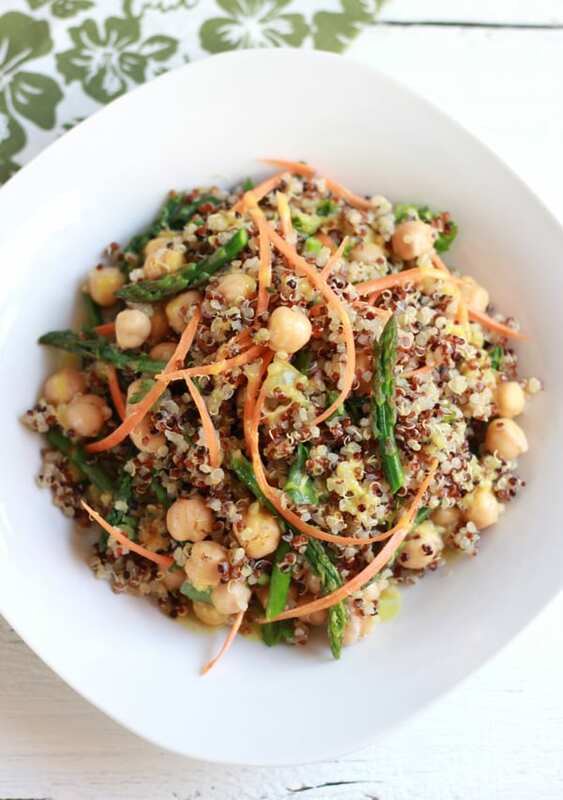 So, I made a quinoa and asparagus salad. Do you know how I feel about quinoa? I’ll put it in pretty much anything. In the beginning of the week, I like to make a big batch in the morning and use it quick meals. It’s great to have on hand for salads and side dishes. 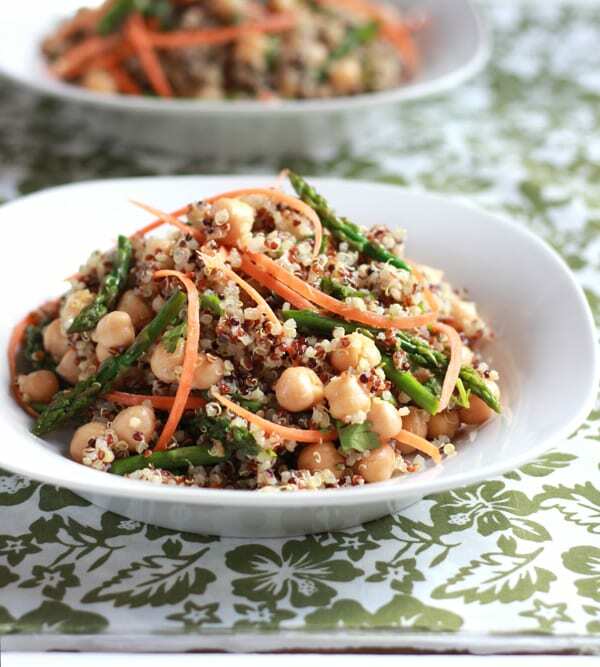 For the salad, I tossed some precooked quinoa with chickpeas and dried cranberries from the pantry. From the fridge, I added carrots, cilantro, and asparagus. And then from the freezer, I used frozen ginger as a base for my curry vinaigrette. I wasn’t sure where I was going with this, but once I started it was hard to stop! My little off-the-cuff creation was a surprisingly delicious. From my rations, I fed the 2 of us, gave some to my parents, and even had leftovers (my kids wouldn’t go near it). It’s great as a main salad or served on the side with fish or chicken. And the best part- I saved myself a couple of bucks and a trip to the grocery store! *For this dish, you can either buy shredded carrots or julienne them yourself. 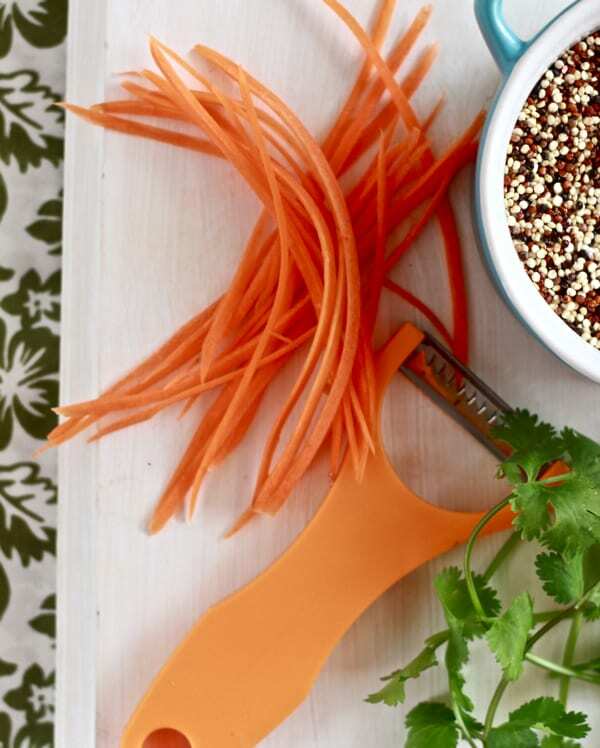 I use this quick & efficient hand-held julienne peeler. It makes life so much easier! 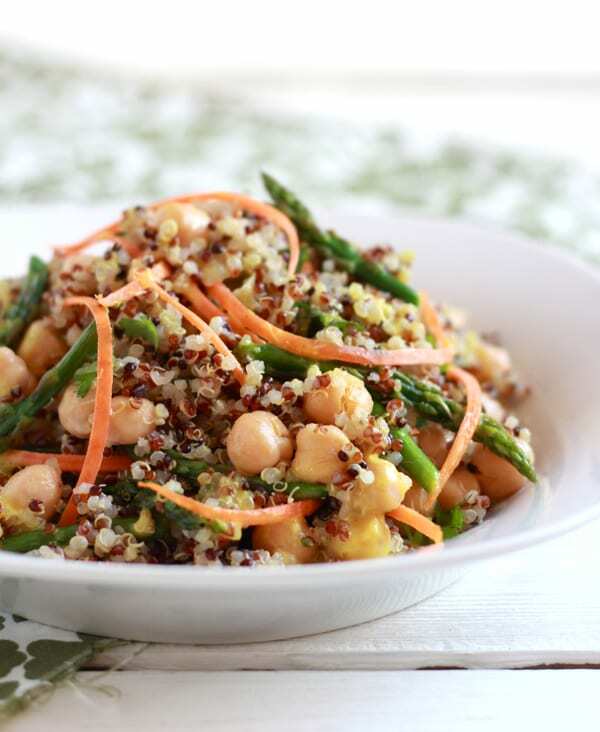 * Substitute with any color quinoa for this dish. Make the quinoa: In a large pot, cook the quinoa according to the package instructions. When it's finished, spread out onto a rimmed baking sheet. Cool to room temperature. You can even pop it in the fridge if you're impatient! 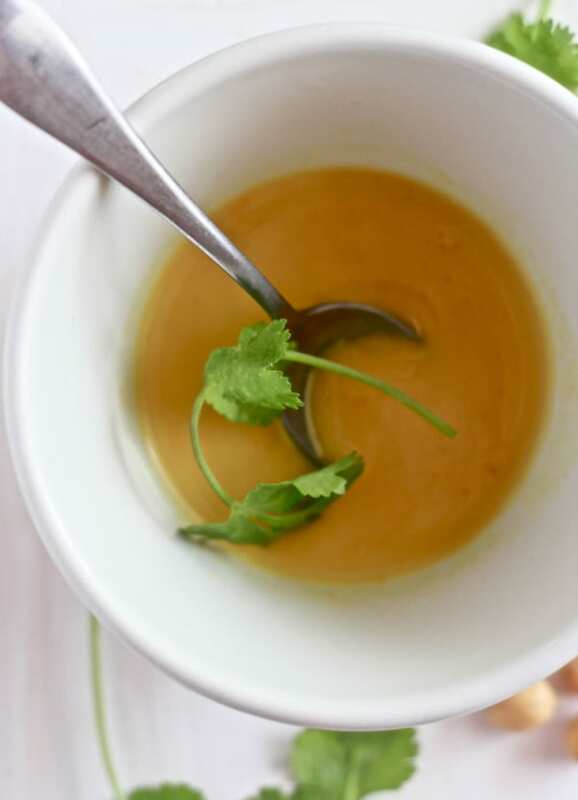 Make the vinaigrette: In a blender (or food processor), blitz the first 6 vinaigrette ingredients. Slowly stream in the olive oil to emulsify. Taste the dressing and adjust seasoning with salt, pepper and extra curry powder is desired. Set aside. Make the asparagus: In a large saute pan, add a splash of olive oil and warm over moderate heat. Add the chopped asparagus, season with salt and pepper, and saute until crisp tender. The time will depend on the size. It's best to slightly under cook the asparagus as they will continue to cook once removed from the heat. Thank you! Yes, the best meals really are born out of necessity. Like your mom, a lot of my meals are just thrown together and then everyone makes fun of my for it! They’re like, “there’s no way you just threw that together…” Oh well, ha ha. You can’t win… Thanks for stoping by! Oh my goodness, this looks so great. Especially after I’ve ODed on iced coffee and Easter candy this morning – my body is saying, “get this healthy stuff into me, quick!” Can’t wait to try it. What a gorgeous salad! Makes me want to make it right now! Pinned! This sounds delicious! I’m going to make it a warm salad and add shrimp to it this week. Can’t wait to try it. We just had this for our evening meal – we loved it will definitely have this one many more times. Thank you so much – delicious !! This sounds SO good – can’t wait to try it, hopefully next week. Thank you in advance, because I know I’m going to love this one! !